Pepsi and Diet Sprite – ADOPTED! Pepsi and Diet Sprite — ADOPTED! Our Featured Pets of the Week are Pepsi and Diet Sprite. 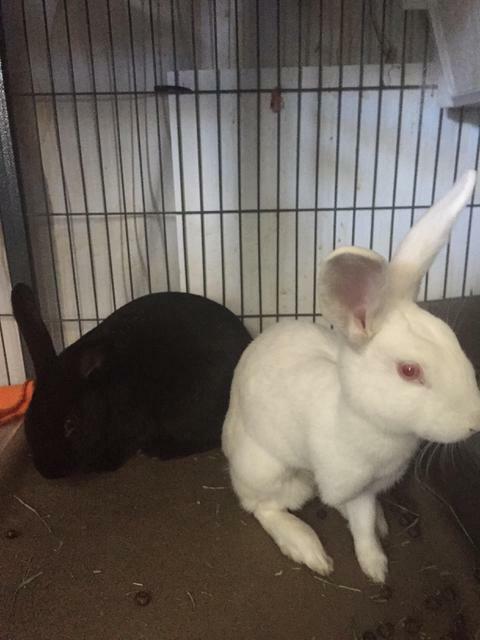 They are an adoptable pair of (likely) New Zealand rabbits. Pepsi is all black, and his sister Diet Sprite is a pink-eyed white rabbit. Did you know all black and pink-eyed white animals are two of the most commonly overlooked shelter pets of any breed? Pepsi and Diet Sprite are a bonded pair of rabbits with everything against them. Two rabbits. One all black, one PEW. And Diet Sprite has only three legs. They’re also a giant rabbit breed. They are young and small now, but they should get pretty big. If you’re interested in giving these sweet babies a chance, check out our rabbit care guide, then apply online when you’re ready to add these sweet buns to your family. Previous Previous post: Petty McPetterson – Adopted! Next Next post: Colossus – Adopted!